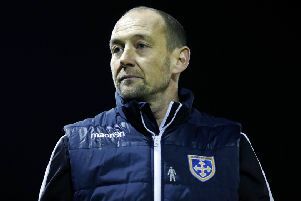 Guiseley were left frustrated after only leaving FC United of Manchester with a 3-3 draw despite being 3-1 up in the latter stages of the game. This National North game had the feeling of the proverbial six-pointer and the visitors made a great start, a corner found Niall Heaton at the near-post and he had a simple finish, with his header going into the back of the net. Both sides battled for possession and chances were few and far between for a 20-minute spell until FC United levelled thanks to a fine free-kick from Kurt Willoughby who placed his shot past the wall and into the bottom right-hand corner. The very next attack saw Guiseley reclaim the lead, Rowan Liburd was able to pass two FC United defenders and after a strong run, he fired the Lions into a 2-1 lead at half-time. Guiseley were looking quite comfortable and went 3-1 up, as they broke upfield with Will Hatfield finishing calmly. Twenty minutes were left to play when a penalty was awarded for the hosts for some pushing in the area from a corner and Willoughby grabbed his second goal. FC United were now in the ascendancy and levelled the scores with Tom Peers rounding Marcus Dewhurst and finishing off clinically. A point wasn’t really what either side wanted from this match and both pushed players forward late on, yet there was no late drama and the points were shared. 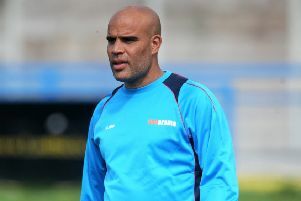 After the draw Guiseley joint-manager Marcus Bignot said: “I’m really disappointed for the players, at 3-1 we looked to be in total control, they got the penalty and the momentum really shifted in their favour. Bradford Park Avenue have now gone seven games without a win – their worst run since October 2016 – following a 1-1 draw at Altrincham. But substitute Danny East’s 84th-minute equaliser means Mark Bower’s men remain above Alty in the play-off frame. East bundled home after Lewis Knight and Nicky Clee had combined to tee up the late chance. The hosts had earlier forged in front midway through the first period when Josh Hancock rounded debutant keeper Charlie Andrew to net. Kallum Griffiths and Scott Burgess earned York City their first back-to-back league wins in 13 months following a 2-1 triumph at Kidderminster. Full-back Griffiths crashed a spectacular 20-yard strike into the top corner to send City into the interval 1-0 to the good. Striker Joe Ironside, who failed to net in 10 outings for the Minstermen during a loan spell earlier this term, went on to level on 75 minutes when he bundled in from close range after Liam McAlinden’s free-kick from the right. But on-loan Bury midfielder Burgess settled matters eight minutes later with another stunning effort, receiving Griffiths’ throw-in before lifting the ball over his marker and beating home keeper Brandon Hall with a dipping edge-of-the-box volley.